This was the second year of the ETC Studio. 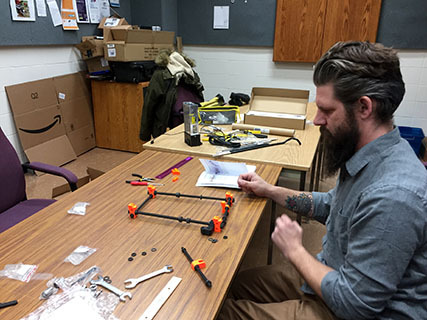 We decided to visit different locations to see what kinds of maker-related activities were happening in Saskatoon. 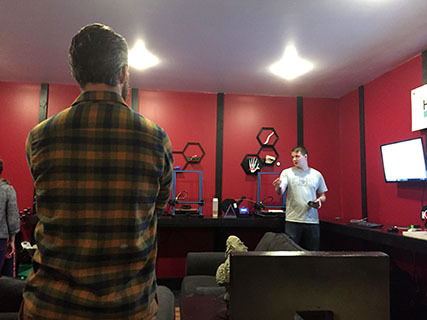 We held our first meeting of the year at Create Café where we had an opportunity to see learn what kinds of 3D projects the Create staff were taking on and to learn what kinds of services they offered. While enjoying bacon-flavoured lattes, we also used our time to plan and schedule our subsequent visits to other locations. Thanks to our host, Albert, we took an excellent tour of Techworks, a membership-based makerspace. Techworks offers 1500+ space and access to laser cutters, 3D printers, a well-equipped electronics bench with soldering equipment, oscilloscopes, power supplies and function generators as well as a great selection of hand tools, saws, drills and other power tools as well as “Goliath” our CNC Router, and a 12″x 36″ metal lathe. 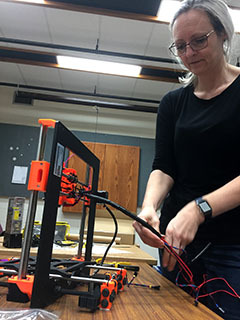 The group offers a “weekly hack night” on Tuesdays when members gather to work on projects, share their projects, and sometimes just hang out. The staff at Sprockety took our group on a variety of Virtual Reality (VR) trips: Star Wars, whale watching, Indigenous storytelling, and amongst other fantastic VR experiences. 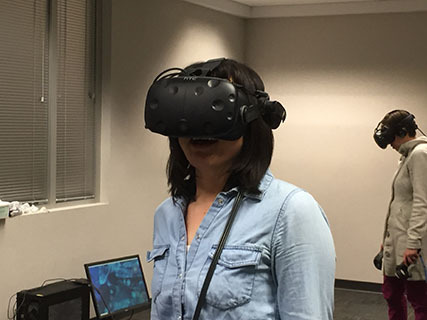 Our group had an opportunity to not only try out VR but discuss how VR could be used pedagogically. 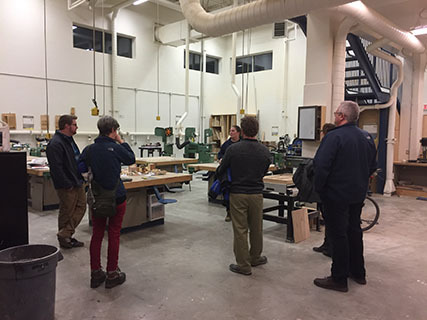 Rob organized a visit to the 3D printer/computer lab and the woodworking shop at Tommy Douglas school. 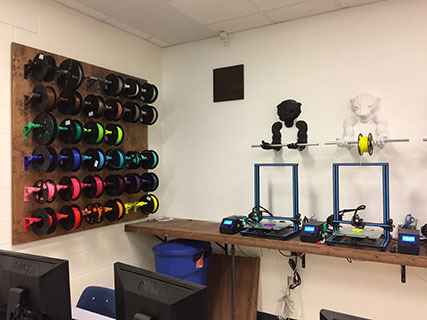 The 3D printers were purchased and installed with the help of Create Café. 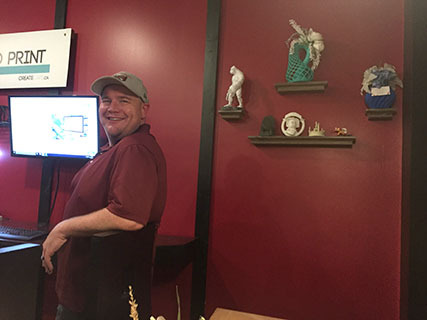 In January, we spent some time in Russel’s makerpace at Caroline Robins. He took us through an engineering task in which we could only use spaghetti, a marshmallow, string, and tape. Russell guided us through an engineering-inspired design process. He also showed his storage system and how he kept all the kids’ activities scheduled and organized. We were impressed with and inspired by his anecdotes of student success. Thank-you to our host, Erin, who invited us into their makerspace activity room. 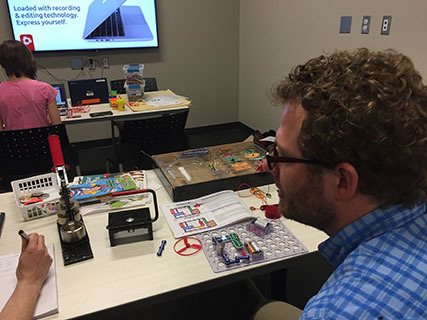 She guided us through the use of the button maker, the Makey Makey, Snap Circuits, and some Osmo games. The library also offers access to Lego, a Cricut cutting maching (like a 2-D CNC), robots, a green screen, and video gaming room. In the meantime, Jordan Epp and I built a 3D printer (Prusa V2.4). For the 2018-2018 academic year, we are planning to spend more time hands-on making!